(Nanowerk News) Scrona Ltd. and ETH Zurich have been announced official World Record Holders for the smallest inkjet-printed colour image. The Guinness World Records Limited achievement involved the use of the groundbreaking 3D NanoDrip printing technology, invented at ETH Zurich and now commercialized by the ETH spin-off company Scrona. The printed image measures a minuscule 0.0092 mm2 in area, or 80 µm x 115 µm. That's about the cross-sectional area of a human hair or the area covered by a single pixel of a retina display. Being so small, the image is totally invisible to the naked eye. To see it, the official witnesses had to use a special microscope. The printed image represents a scenery of clown fishes around sea anemones. The colorful little fishes that grow to a size of just about 10 cm. in real life have been shrunk to approximately 30 µm. Thanks to 24bit color depth in the printout the picturesque scene that depicts their home appears almost as colorful as in reality. What makes the image appear so lively is the result of so-called quantum-dots (QDs). QDs are nanoparticles that emit light of a very specific color. By tuning their size, this color can be freely engineered, for example from orange to yellow. QDs are known to be very intense in their color appearance, a reason why they currently make a strong debut in flat panel displays. 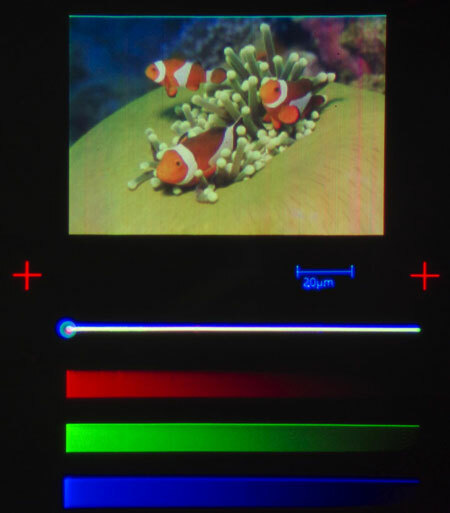 To create the clown fishes and their cozy sea anemone homes, layers of red, green and blue quantum dots were printed at a resolution of 25'000 DPI, i.e. at an inter-pixel distance of 500 nanometers. To define the 24bit color space the thickness of the deposited quantum dot layers had to be controlled with incredible sub-nanometer precision, at each pixel location. Until now, even with cutting-edge semiconductor technology, it was not possible to handle these nanostructured materials with the incredible accuracy that is demonstrated by this Guinness World Records Ltd. achievement. Therefore, the image printed by Scrona and ETH Zurich is not only nice to look at. It highlights new avenues towards the use of nanostructured materials in future electronics and optics, particularly in the display sector. But before hitting industry, Scrona is now providing a unique opportunity for everyone to experience the technology. Via kickstarter they offer copies of the true-to-life micro-image, but instead of clown fishes they print the personal content provided by the buyers. In the package is also contained a powerful miniature microscope that is used to render the microscopic pictures visible. This offer is open until 9th of January when their campaign ends.